Worship - we believe that worship is not just about singing songs - in fact any activity (art, poetry, washing up, walking in the countryside) can be an act of worship if it draws your heart closer to the Father and it is done to bring Him pleasure. We do enjoy singing a range of songs that help us express our hearts to God. Cafe Amen - this is a wonderful way of discovering God through the scriptures, and we sometimes do it on a Sunday morning. We take a passage from the Bible and sit round tables with a coffee while we get right into the atmosphere and meaning and relevance today of the passage. Eveyone has a chance to share and feedback what it says to them. Bible Study - we meet on a Thursday afternoon to take time to discover more of God through different passages of the Bible. This is not done in a heavy intellectual fashion but with the real purpose of listening to what God is saying to us now through this passage. As we meet, we trust that the Holy Spirit in each one of us will draw out different things that are helpful to us. We are often amazed at how much can be discovered from even one verse of the Bible. 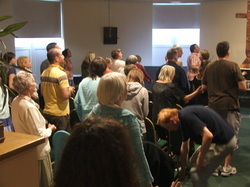 Prayer and Share - this is where each person prepares something to share with everyone else on a Sunday morning. A bit like bringing things for a buffet, this is a spiritual buffet! It can be things that God has spoken to you about in the week, an inspirational scripture, a testimony, a song, a prophecy, a dream, vision or other picture, a prayer etc. These are great because we all have a unique relationship with God, and so each person brings something valuable that we can all learn from. There's no pressure to share if you don't want to! Prayer - we believe that prayer is to be simple like a child talking to his or her Father and not a heavy religious exercise. We also believe prayer is a two way conversation so we try to listen as much as we speak. We don't have set prayers but pray as we feel led to by the Holy Spirit. We have a prayer focus for each week that we feel God is wanting us to pray into, and those that are available meet on Thursday mornings to spend time on the focus. We also have a prayer / soaking meeting before the Sunday morning meeting. We will always pray for individuals who have specific requests, and believe in the love and power of God for physical and emotional healing. Church retreats and holidays - we have a regular 'retreat' (time away to spend with God and each other) in January when we go away for a weekend. We have also had many holidays together, including trips to France, Hungary and Gloucester. We have 'away days' during the year as well to seek God together in a different environment. These are really enjoyable times discovering new places and new cultures and spending time with each other that we wouldn't get chance to on a Sunday morning. House groups - for those that want to we meet midweek in the evening in different houses. This is a great place to form deeper relationships and to share with one another what is going on in our lives. Again, there is no set formula and the purpose is to provide safe space for people to grow in their relationship with God and each other. Coffee and cake is usually featured! Life group - for those new to the faith or just exploring, or those who simply want some new friendships to 'do life' together with. There is plenty of discussion and chance to ask questions. Fun, walks, trips out etc - like any family we enjoy doing stuff together. We often have countryside walks, trips to the seaside, barbecues, meals out, Friday night football, new Year's Eve party etc. For any other info on what we do, believe or practice please don't hesitate to get in touch with Ollie. You will find contact details on the contacts page.